I was recently sent a copy of the new cookbook called EATS Enjoy all the seconds by Mary Rolph Lamontagne It has 135 recipes with beautiful colorful pictures for each recipe. All the recipes are healthy and the author includes the health benefits of the ingredients in the recipes. The idea behind the recipes is that you use your leftovers to make a new recipe. 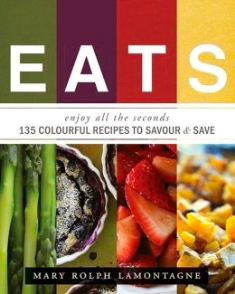 EATS offers:27 master recipes, 108 alternate recipes, 135 recipes in all. The book is more than just recipes, it shows how to reuse leftover ingredients so you are not wasting food. She also includes tips for growing your own food and storing your ingredients. I loved the recipes in the book because they were healthy and I know even my kids would enjoy them.